There was something unrealistic about standing within 10 ft of a pack of Indian wild dogs. Popularly known as Dholes and classified as an endangered species, this elusive pack of wild canines was busy gnawing at what appeared to be the skeletal remains of a deer. 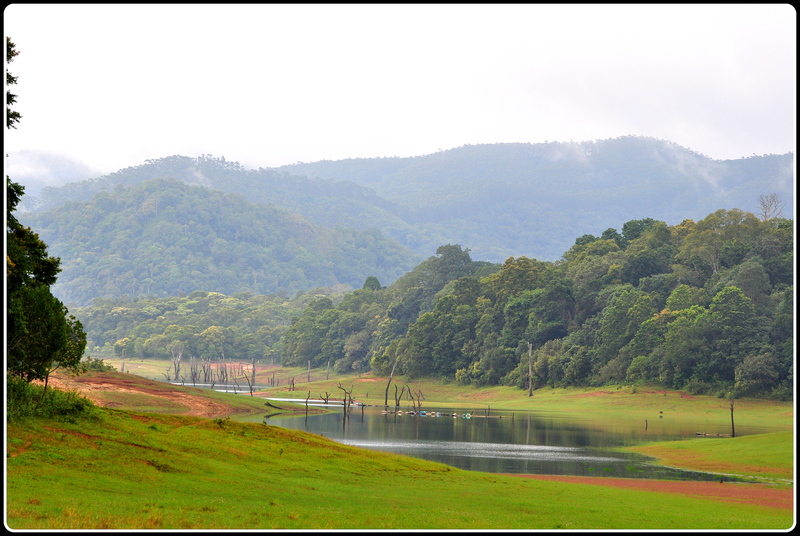 It was 7.00 on a crisp Thekkady morning and we had just embarked on our three-hour nature trek from the Periyar Tiger Reserve nature interpretation center. 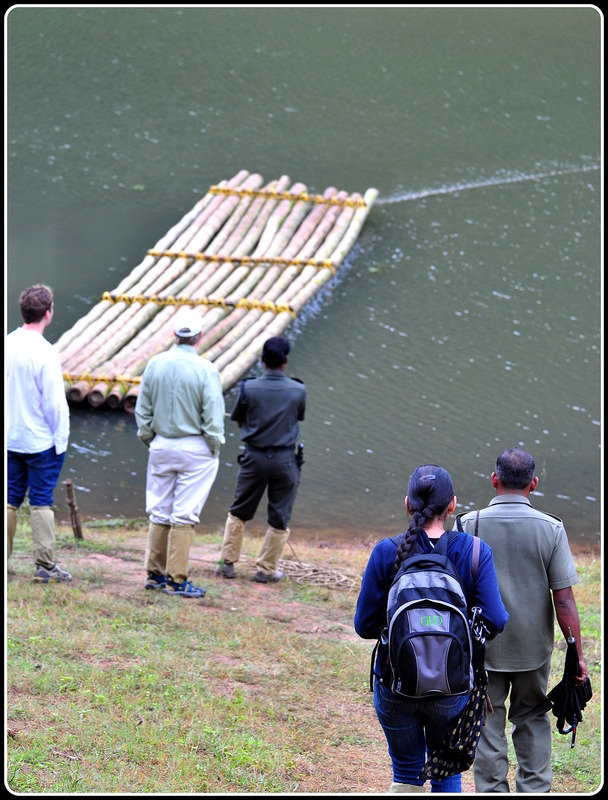 Earlier, we had crossed a small creek that was part of the Periyar reservoir, standing precariously on a bamboo plank. We had just commenced our walk along the fringes of the forest when we came upon an open meadow. The Dholes were stationed here. I did the only thing I could possibly do in those circumstances – pull out my camera. 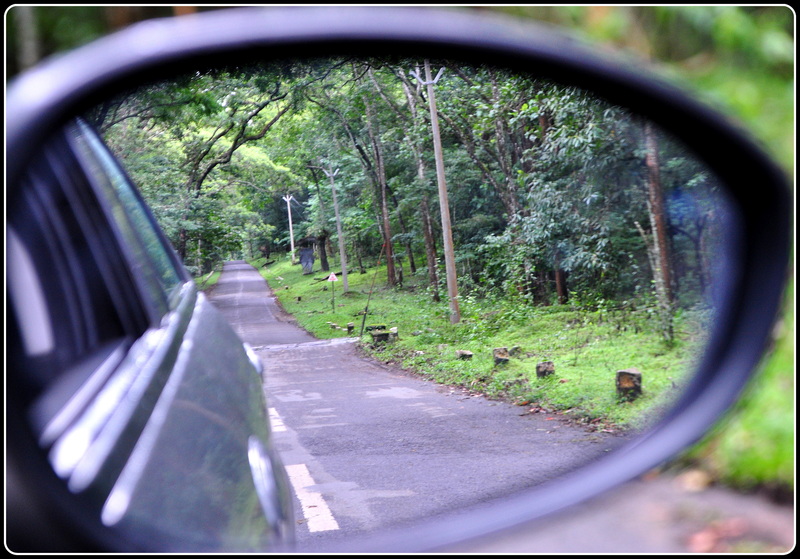 We were on the last leg of our five-day drive from Bangalore to Munnar and Thekkady. Having already covered Munnar in the last three days, we had reached Kumily the previous day and had put ourselves up at a home stay, Pepper County, owned by the lovely and enterprising couple, Mr. and Mrs. Cyriac. 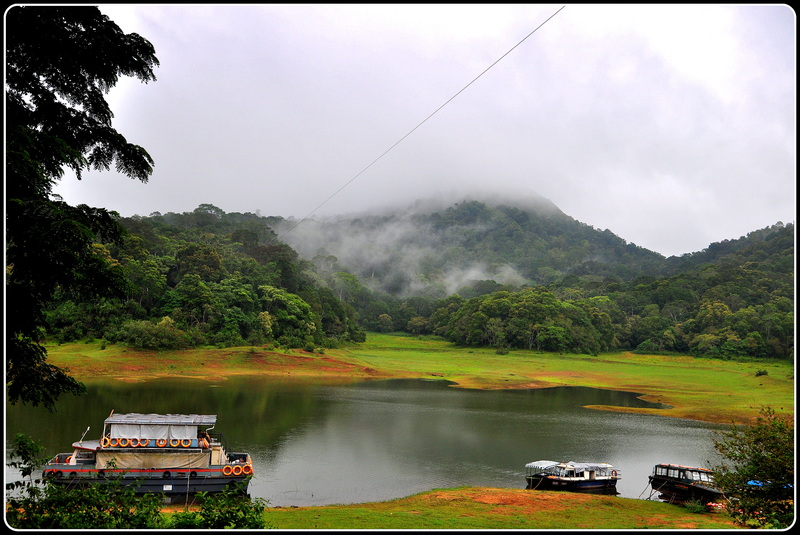 Periyar Tiger Reserve is situated in the southern part of the Western Ghats spread across the Idukki, Kottayam and Pathanamthitta districts of Kerala. 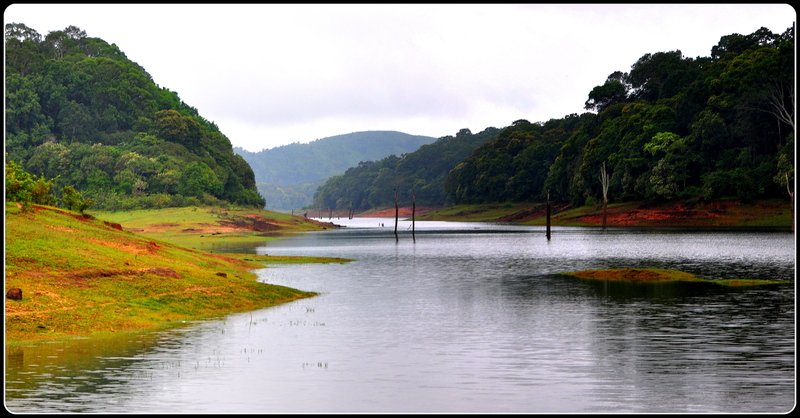 The reserve is also the catchment area of the river Periyar. 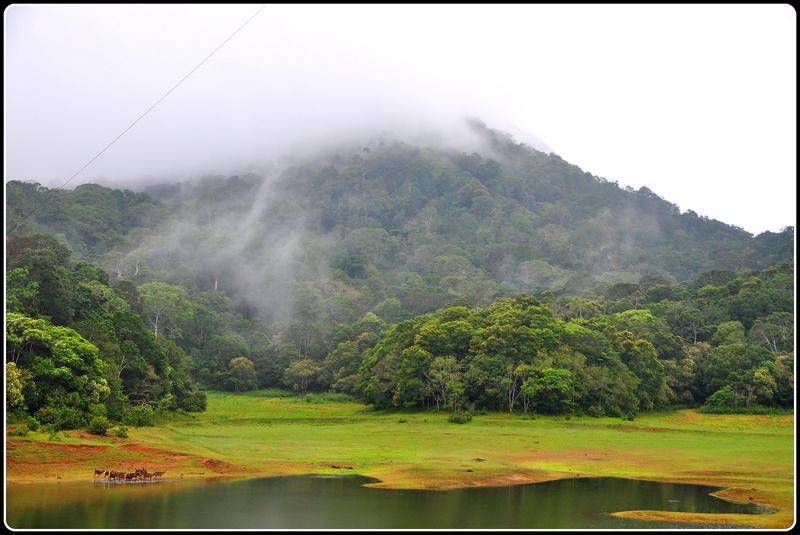 Periyar National Park is one of the few national parks in India to remain open even during the monsoon. We had earlier decided against the mandatory boat ride, the most common activity that tourists prefer to do when visiting the Periyar Tiger Reserve. We didn’t want to look touristy in our own home state by going on an hour and a half long boat ride with a load of other tourists ‘just to spot some wildlife’. There is no advance booking for the boat trip and there is a mad rush in the mornings to reach the booking counter and we did not want to be a part of that. 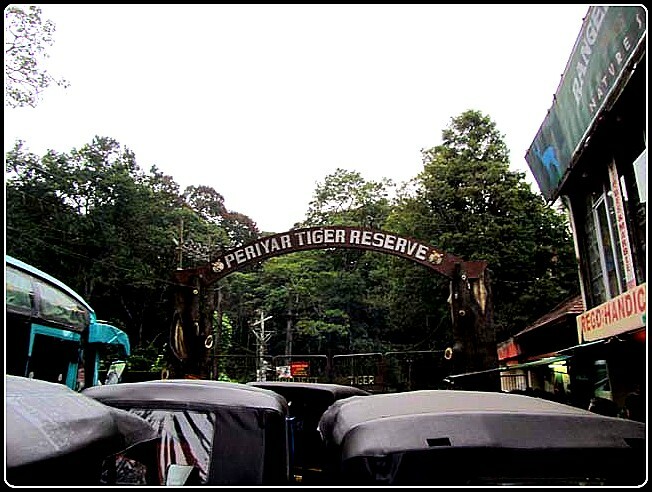 At 6 am we were standing behind a file of about 20 vehicles, autos, buses, taxis, and cars, before the closed gates of the Periyar Tiger Reserve – all of us patiently waiting for the gates to open. It was astonishing to realise that, at that early hour, there were so many people lined up for entry tickets. We were almost sure that most of them were here for the boat ride. From the entry gate, one is only issued the entry ticket and a parking ticket. To get a ticket for the boat ride, you have to drive another 2 km from the entry gate, park your car and then run to the ticket counter, another 500 m from the parking lot, and join the jostling queue. It was a wet and cold morning, but tempers were definitely hot and short. Once the gate was open, there was a small rush as every car was aiming for that first spot in the queue. Nobody was overtaking but positively speed driving, way above the 20 km/h speed limit. We joined the mad rush till the parking lot. From the parking lot, the others continued, most of them probably boosted by the idea of having an upper deck ticket so that their chances of ‘spotting wildlife’ improved. We had already booked a slot for the nature trek, the previous day, which was supposed to start at 7 am. As we were at least an hour early, we thought we would do a recce of the place. We first watched the excited tourists get packed onto the boat. 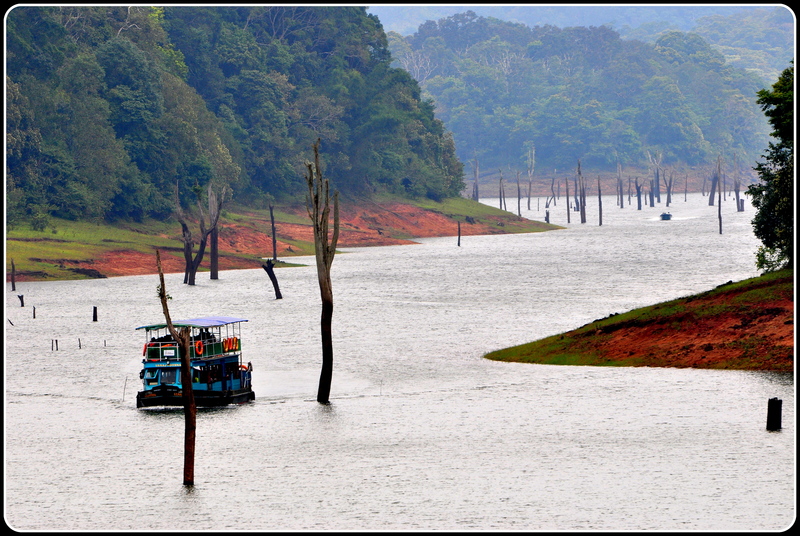 After the boat tragedy of 2009, the authorities have limited the number of boats at Thekkady. Later, we remained on the porch of the ticket counter from where one could get the best views of the reservoir. Early mornings are the best time for animal sightings as most of the wild animals come to the water. 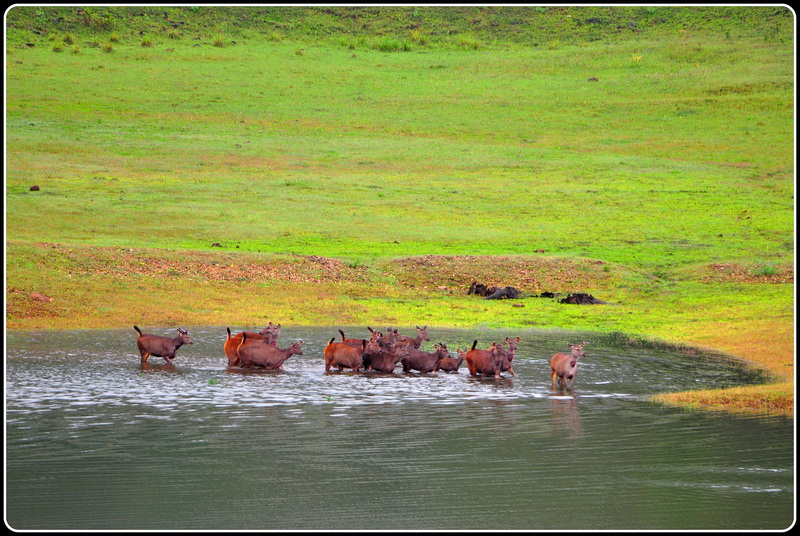 We watched a herd of Sambhar deer coming to the water and prancing around. 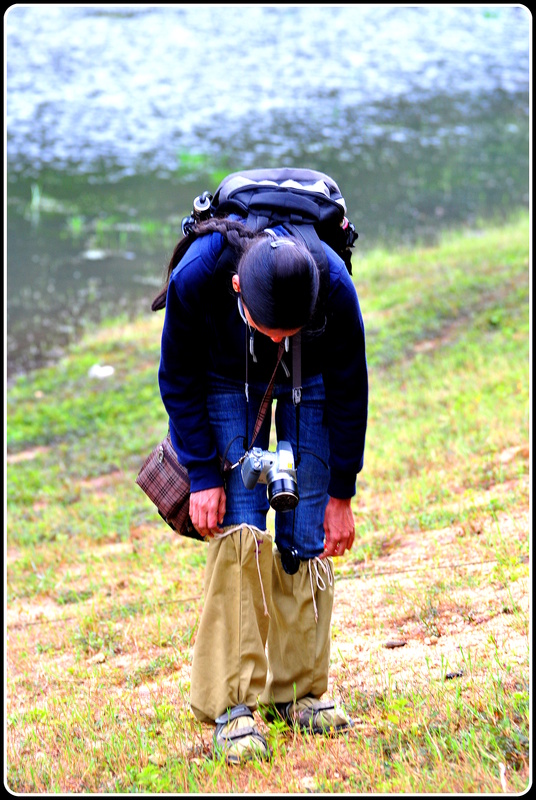 By 6.45, we had assembled at the Nature Interpretation Center and were busy struggling with the khaki leech socks that were being provided to us by the forest department. 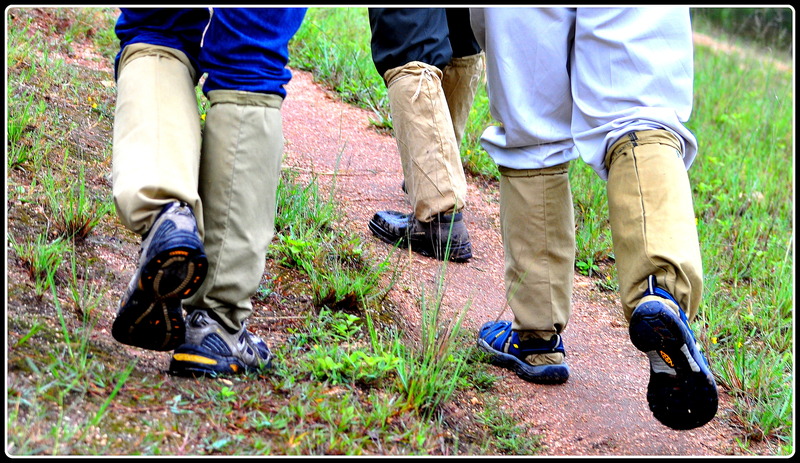 These long leg covers, to be tied over your legwear, are supposed to protect you from poisonous insects, reptiles and the scariest ones, leeches. We were also asked to fill in forms with our contact details and the next of kin’s contact numbers and address. Struggling to keep the leech guards on. The leeches didn’t have to !!! 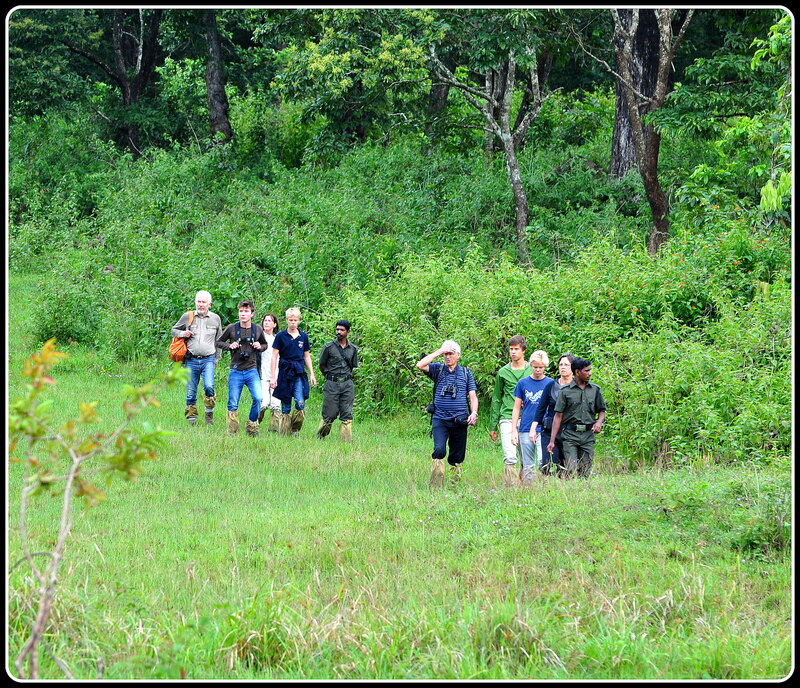 The nature walk is a light trek where every group is led by an experienced forest guide and can have up to a maximum of six individuals. The prescribed fee is Rs. 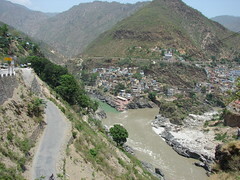 200/- per person but as the minimum fee for the trek was Rs. 800/- and as there were no other members in our group we had to dole out Rs. 800. 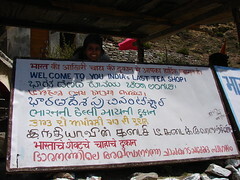 It was also surprising to note that there were no other Indians in any of the other trekking groups. So much for the love of the forest! The Kerala Forest Department has employed local tribesmen from the Mannan community, who have a good knowledge of the local flora and fauna, as guides for the treks. The Mannan community, the oldest tribal community in the Periyar Tiger Reserve area, was primarily into fishing and cultivation. 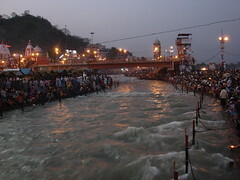 With the spread of tourism, many have now become guides. Under a program in association with the German government, they are trained to speak English, Hindi, Malayalam, Tamil, and even foreign languages like French, German and Spanish. Our guide, Mr. S, who had 10 years of experience, seemed to be quite knowledgeable about the jungle. After gearing ourselves with the leech socks, we started our trek. We had to cross a small creek first. It took a huge amount of practice and balance to stand still on the bamboo plank. There was the uneasiness of one’s footwear getting wet or, even worse, the dismay of plunging into the reservoir in its full glory. Neither of it happened and we started walking along a forest path. Before reaching a clearing, S gestured with his hand and told us not to move. He cupped his ears and told us to listen carefully. We could hear a high-pitched whistle. We slowly walked towards the clearing and hid behind a few brittle bushes. It was then that we spotted the Dholes. There were around 7 or 8 of them, some of them busy gnawing, some of them cautiously looking around and a few of them just moving around. 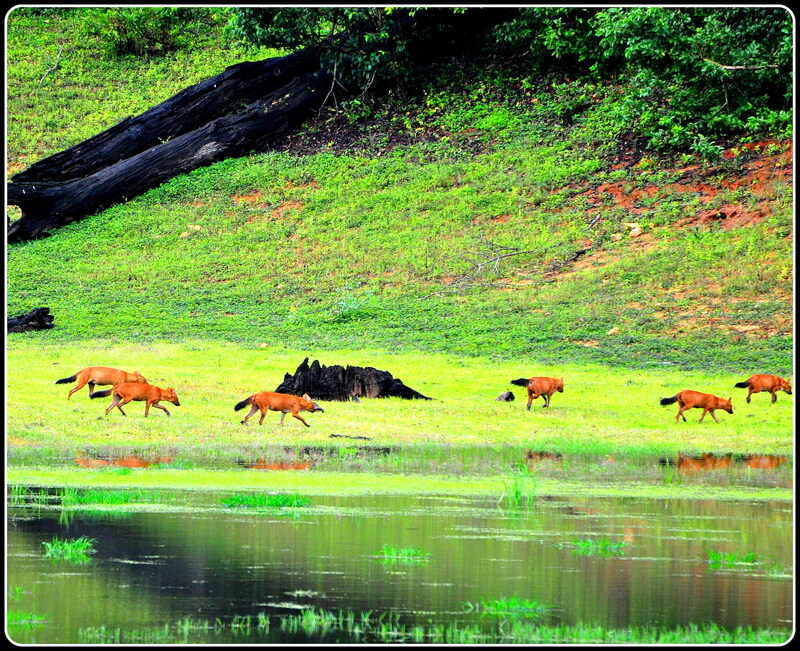 The Dholes must have sensed human presence as they suddenly got up and moved a bit further even as we silently pursued the pack. Dholes are supposed to be shy and cautious animals and are found to tolerate a minimum amount of human disturbance. Dholes are probably the only carnivores found in India which has never been accused of attacking humans. On the other hand, it is a common practice of the tribals to often steal Dhole kills, many a time right from underneath their noses!!!! Dholes live in packs and almost look like larger dogs but with a more reddish coat and a black bushy tail. Dholes, like dogs, are very social and communicate with each other by whistling. Dholes hunt together, teaming up to take down smaller animals like hares, rodents, pigs, and even larger preys like Sambhar deer, wild boars, and Chital. They are also quite ferocious and always end up tearing rapidly into their prey, sometimes feasting while the prey is still alive. Sadly, the Dhole is an endangered species. 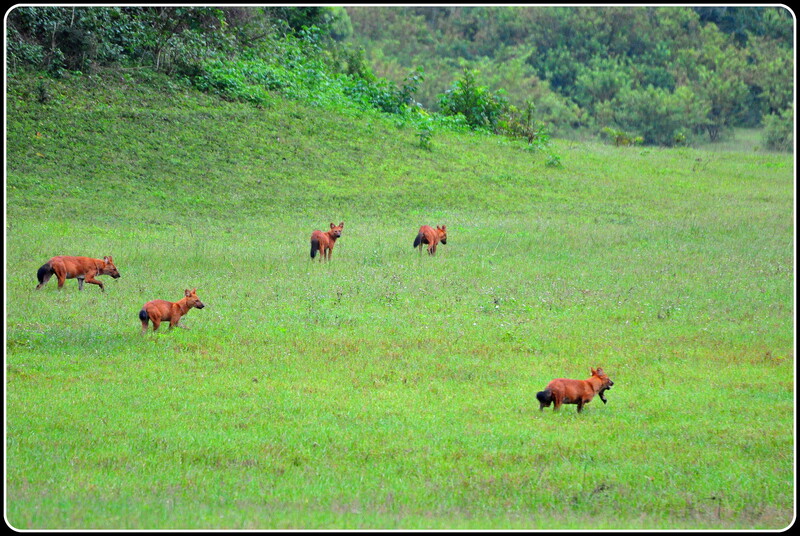 As we walked further, the Dholes kept moving away from us, crossing over a patch of marshy land, half-swimming, and half-trudging and finally disappearing into the cover of the forest. 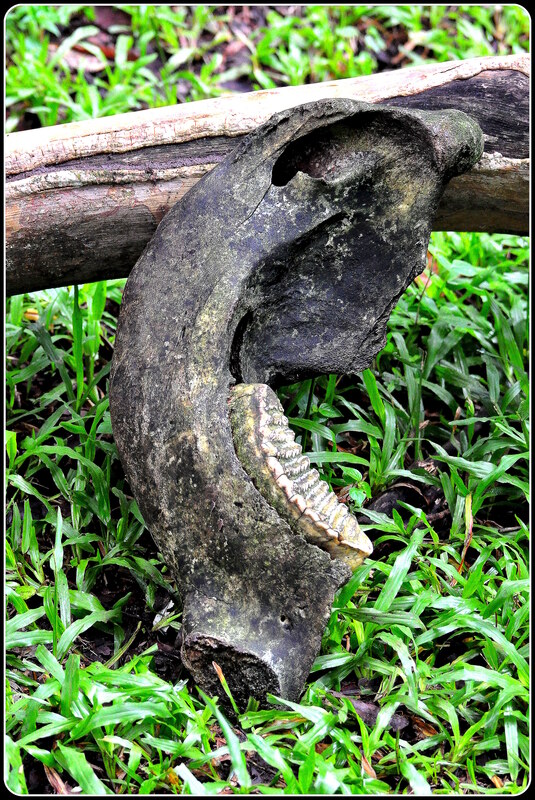 Right on the side of the marshy patch was the skull of an Indian Gaur supposedly killed and eaten by a tiger about a year ago. 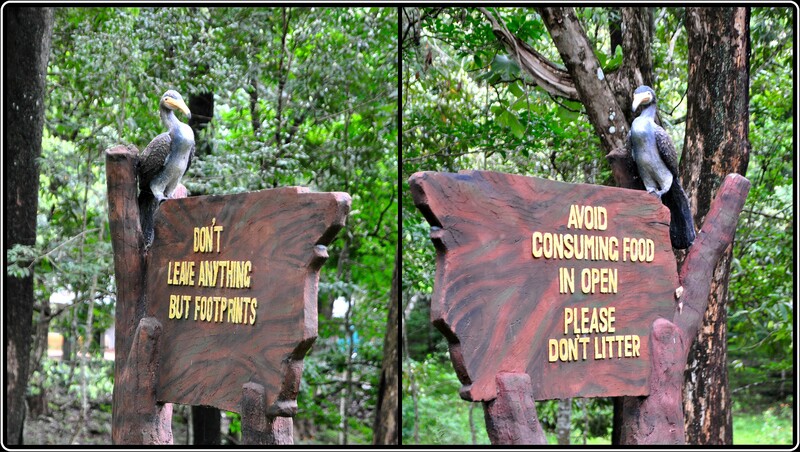 The forest department had not removed the skull so that visitors could get to touch and feel it. 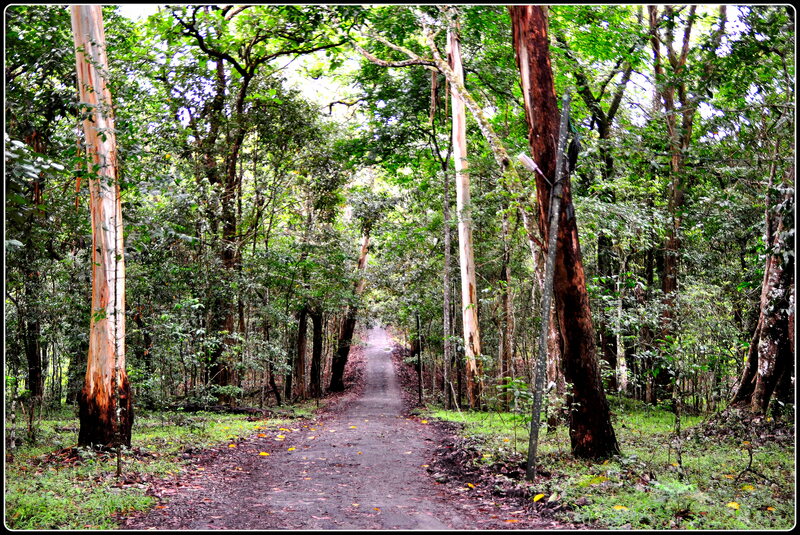 Suddenly the forest was reverberating with the unmistakably large whirring sound of the Great Malabar Hornbill. We had already seen some of its cousins in Arunachal and were quite familiar with the sounds and sights of the bird. S pointed to us where a hornbill nest existed and told us to wait. 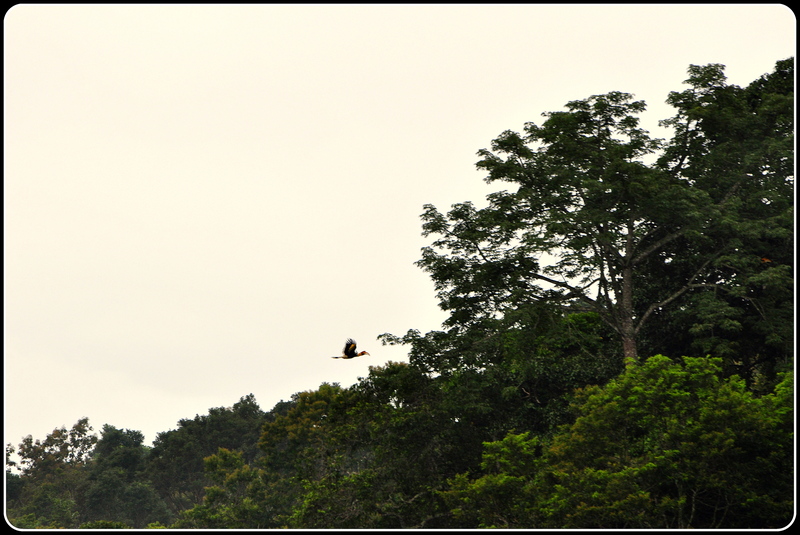 In less than a minute, we saw a hornbill swoop down from the skies and hop onto the tree. We were now walking towards the forest. Throughout the three hours trek, we learned about several different types of trees, birds, and animals. Though we were not expecting a few tigers or leopards to pose in front of us, we were quite satisfied by spotting a great variety of birds and also listening to the beautiful songs of Malabar whistling thrushes, the hoots of the coucals and the calls of the hornbills. 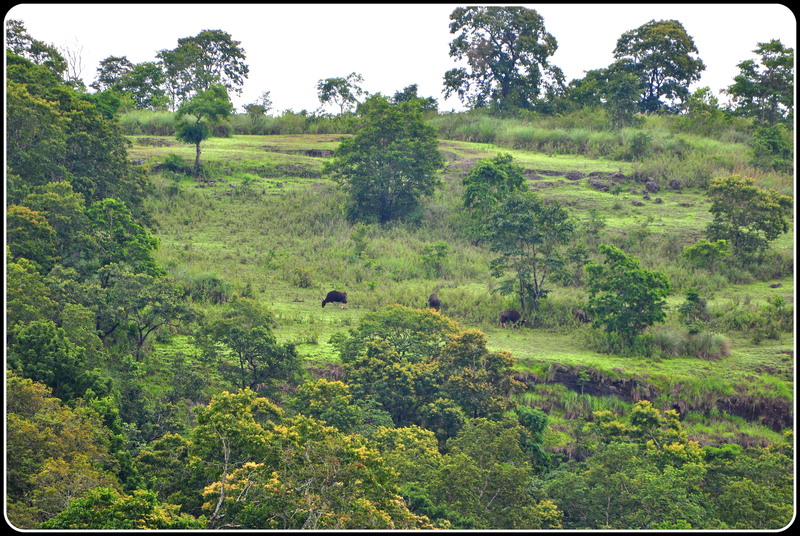 We also came across Nilgiri langurs and a couple of Gaurs which were grazing up on a nearby hill. 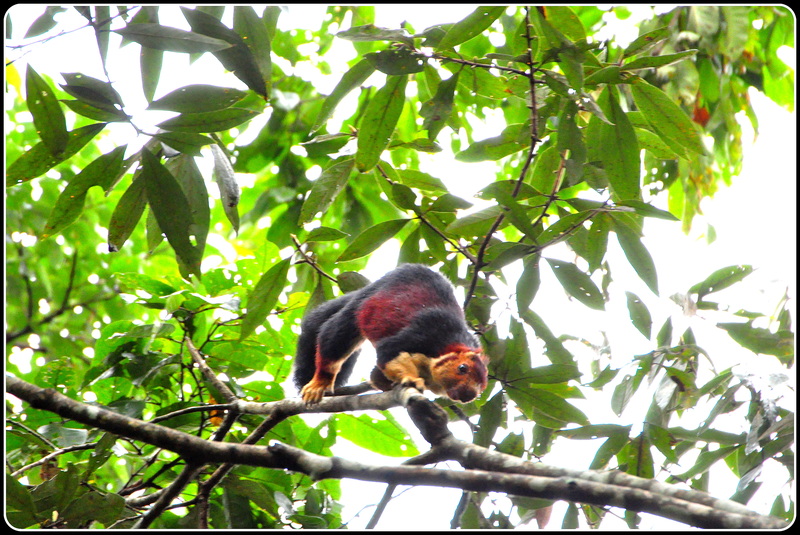 The most beautiful find was the Giant Malabar Squirrel. But what took our breath and a lot of blood away was the leeches. It is really amazing to see how these tiny creatures can jump onto one’s body like an acrobat. Also, stuck to our shoes were plenty of leeches that we constantly flicked away with twigs. At one point, S sprayed some tobacco powder on our shoes which he said would keep the leeches away – not that it did. Guess our leech socks were not thick enough! The jungle is alive. You just have to look around. We realized that, apart from providing an opportunity to experience forest life, this trek also creates awareness in the prevention of poaching and other illegal activities like sandalwood smuggling. 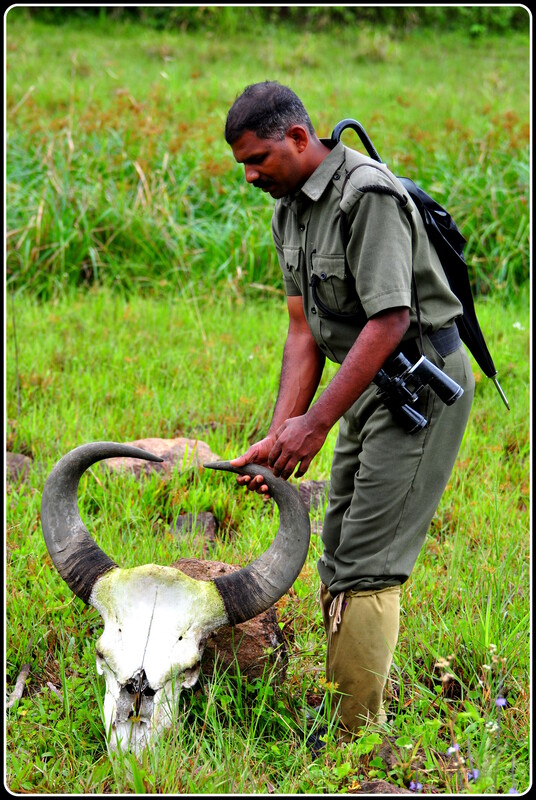 A lot of the night patrollers were once poachers and had been given an opportunity by the forest department to be a part of their special protection team. The plus point, of course, is that they know the forest inside out. The most dangerous and unpredictable animals are sloth bears and elephants. S’s brother, a night patroller, was once attacked by a sloth bear and fractured his arm and had a rod inserted. Sloth bears are at their highest alert during breeding time and when they have cubs. We also came across a huge elephant tooth, belonging to an elephant which was killed by another two years ago. In that same year, around seven other pachyderms were killed by this very elephant. We had read in the previous day’s papers that a wild elephant had run amok in the jungle and a lady got injured. We asked S about it and were surprised to hear that he was witness to the whole incident. He had been leading a group of 6 people when the elephant came running through the jungle, catching a group of tourists unaware. In the melee that ensued, a lady fell down and fractured her leg. 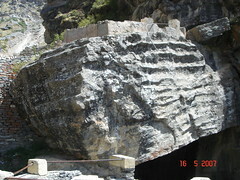 S said that he did not even have the time to warn the tourists. My hiker’s eyes did travel longingly to the summit of a small hill across the river. Seeing our enthusiasm, S mentioned that the forest department also conducts a day and night trekking/camping program. Another interesting program is the Jungle Patrol where tourists are given an opportunity of taking part in the regular night patrolling inside the reserve. It is interesting to note that this is the only tiger reserve in the country where night patrol is allowed. 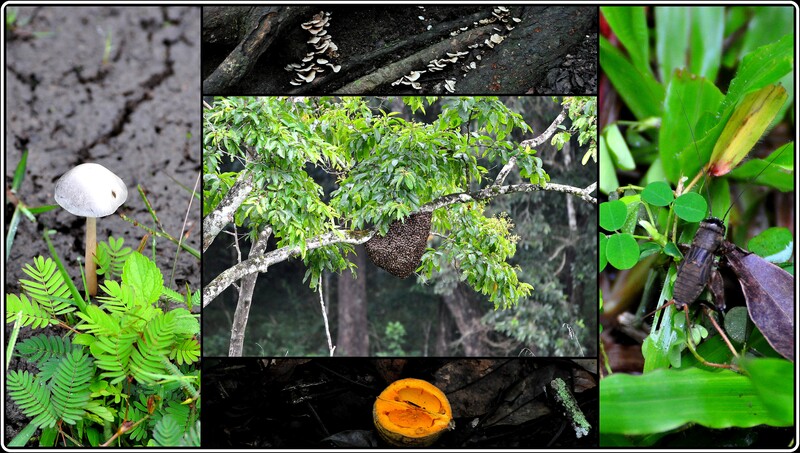 The objective of this activity is to not only explore the jungle at night but to also understand how tough the work of the forest department is. As all the forests of Tamil Nadu, Karnataka and Kerala are contiguous, sandalwood smugglers travel all the way from the other states, bare feet and barely clothed with oil applied all over, making it difficult for the patrolmen to catch them. Another recent addition to the activities is bamboo rafting, a full day activity which includes both hiking and rafting. Tourism is highly regulated as only 30 sq km of the park is open to tourists and trekking is only done around the buffer area. Do Indians hate a walk in the jungle? 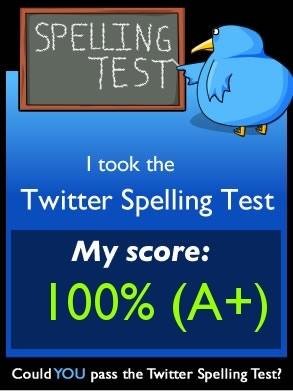 Go figure!!! In spite of the fact that this reserve being home to a vast assortment of wildlife species, wherein a number of birds and animals are unique here, we found that most of the times these activities are only booked by foreigners. This reserve is visited by wildlife enthusiasts and nature lovers in crazy numbers, all round the year, but most of them only make it till the boat ticket counter. Move away from the crowds. Explore the nature. It is bound to leave you gasping in wonder. Step away from the usual path. It can be a rewarding experience. In every walk with nature, one receives far more than he seeks. Peace, clarity, happiness……? Our feet were definitely happy.